We are Proud to Serve You and always want to hear your feedback! This letter is to compliment your staff at the Colorado and Mexico store. First and foremost, I want to recognize Ludy for being the absolute BEST server I have ever experienced. On Saturday, March 6th, I visited the store with my brother who is on oxygen, in a walker and extremely ill. As he doesn't get out often it was difficult for him to make a division about what to have for breakfast. Ludy took the time to explain his options and made suggestions about how he might find something he would like. She was extremely kind, patient and very "happy", making our experience delightful. My brother had a burger for breakfast. When she realized he couldn't eat the entire meal, she brought him a box for the burger and even a small container for the mayonnaise. We never had to ask for anything, as Ludy paid attention and took the initiative to go the extra step to provide outstanding services. Being amazed at the service we were receiving, I started watching Ludy take care of her other customer. I noticed that everyone was receiving the same attention with that wonderful smile and attitude that makes everyone feel good. I asked to see the manager on duty. I didn't get his name, but he thanked me for taking the time to compliment Ludy and was happy to give me this address. As we left the store, we were assisted up the stairs by another person. This may seem like overkill in the compliment department; however our entire visit was a pleasant experience and we recognized that making your customers comfortable is a store priority. Since we live in Lakewood, we may not be able to get into this store often, but I assure you that everyone I know will hear this story. Please thank Ludy personally. She is a gem! I don't often take the time to send one of these but the food at Le Peep in Park Ridge is always fantastic and served as ordered. Paulette and Diana are always a delight and go that extra mile to ensure the kids are happy and everyon'es visit is enjoyable. They are the reason I come back for more! Great service! Great food! Very busy! Well worth the short wait. Staff are very friendly, quick, observant, and smiles on all. First time at a LePeep. Hope to visit again when my family and I go back to Denver. Thank you from Beloit, KS! My sister and I went to the Le Peep located at Memorial City in Houston for breakfast this morning. We each had a strong craving for Eggs Benedict and neither of us could think of any place but Le Peep to satisfy this craving. The wait was short, the service excellent and the food was fantatic! My sister and I were both very pleased with our visit. Thanks for such a wonderful Sunday morning. In a word, wonderful!! We are greeted by a exceptional staff and management team. The food is always hot and tasty. 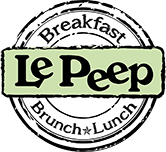 Just wanted to tell you I just discovered Le Peep restaurant, and they are EXCELLENT! Thanks for having such a great chain! Your restaurant was a fantastic find!!! I saw your ad in the supplement in the PJ's while staying at the Par-A-Dice Hotel. It is definitely worth the trip to Peoria just to go to "LePeep"! This was my first visit. I had never heard of the restaurant, but after passing by the day before, my husband and I decided to try it. Wow! The food was great and the service was out of this world. Loved the variety on the menu!!!!! I just wanted to say what a wonderful experience Le Peep was. Anytime I want to eat out for breakfast I know exactly where I am going now. I had a friend recommend it to me and it was outstanding. Not to mention the	service was wonderful. My server was on top of everything and the hostesses were very nice as I walked in. I would suggest trying it if you live in the Charlotte area! Submit your compliments or complaints to us by visiting our Feedback Page!